Joel Lanning was impressed head coach Matt Campbell in the Cyclones’ 41-14 win over Akron on Saturday. AMES, Ia. – Joel Lanning has already made massive strides in his first season at linebacker. 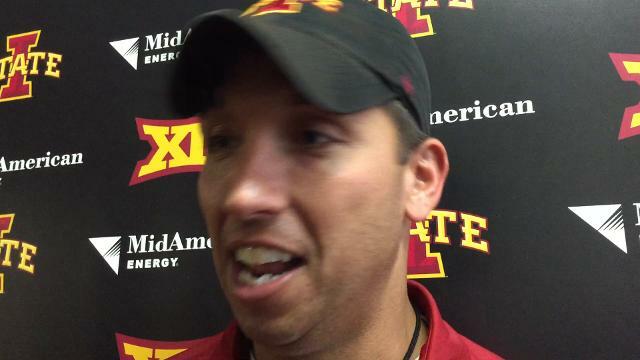 But even Iowa State coach Matt Campbell can’t help but wonder how good Lanning could be if he already had a year or two at the position already. If Lanning was several years into his transition to linebacker, “you’re talking probably a high-end draft pick type player and he’s working his way into that conversation right now,” Campbell said. Lanning, a quarterback turned linebacker, tallied a career-high 20 tackles against Texas. A new battle emerged when Iowa State released its new depth chart Monday. Mike Warren or Landen Akers were listed as the possible starters on kickoff return. The kickoff return game has been a struggle for Iowa State so far this season. Iowa State ranks eighth in the Big 12 conference averaging 18.0 yards per return. Warren had been handling the duties but Akers got his shot in Iowa State’s last game against Texas. All four of Texas’ kickoffs weren’t returned. 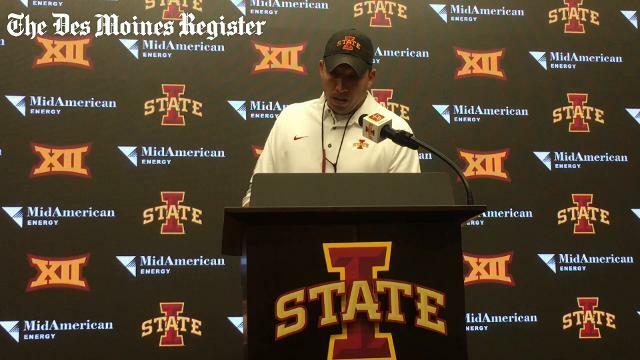 The Iowa State head football coach talks about why his star running back struggled in a 17-7 loss to Texas on Thursday. Akers has been praised by Campbell as one of the fastest players on the team. Campbell said that Johnnie Lang remains an option as well. “Just trying to get some momentum back there,” Campbell said. Running back Kene Nwagnwu was back at practice Sunday. But Campbell said it’s too soon to say if the sophomore would be back on the field for a game this season. Nwangwu’s status for the season remains up in the air after an Achilles injury cost him the spring and the start of the season. Campbell said Nwagnwu was back at practice and in full pads but limited in what he could do in his return. Iowa State could be without offensive lineman Oge Udeogu for the remainder of the season. Campbell said that the best-case scenario would be Udeogu returning by the end of the season. Udeogu, a redshirt junior, is no longer listed on Iowa State’s depth chart. He was replaced by Josh Mueller, who is listed as Josh Knipfel’s backup at right guard. Iowa State’s Oct. 14 game against Kansas will kickoff at 11 a.m., and be televised on FSN. The early kick has become a familiar time for Iowa State this season. Iowa State has already had two 11 a.m., kicks this season. Iowa State takes on No. 3 Oklahoma at 11 a.m., on Saturday.